Stems: Erect or ascending, simple or branched; lower branches often decumbent and rooting at nodes. Leaves: Alternate, lanceolate to elliptic, 1 to 6 inches long, up to 4.5 inch wide, tapered at both ends, short-stalked; stipules cylindric, with long bristles on top margin. Inflorescences: Raceme, single or few, slender, erect or drooping, 1.5 to 4 inches long, 1/5 inch wide, terminal; flowers not crowded, lower ones often irregularly spaced. Flowers: Perianth bases greenish, lobes whitish; covered with tiny glandular dots; stamens and styles not extending beyond perianth lobes. Fruits: Achene, 3-angled or lens-shaped, dark. Habitat: Marshes, stream edges, wet ditches, and pond and lake shores. Distribution: East 4/5 of Kansas. 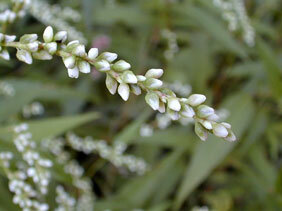 Uses: Native Americans treated stomach pains with a decoction of dotted smartweed leaves and flowers. Comments: The common name refers to the tiny glandular dots on the perianth.